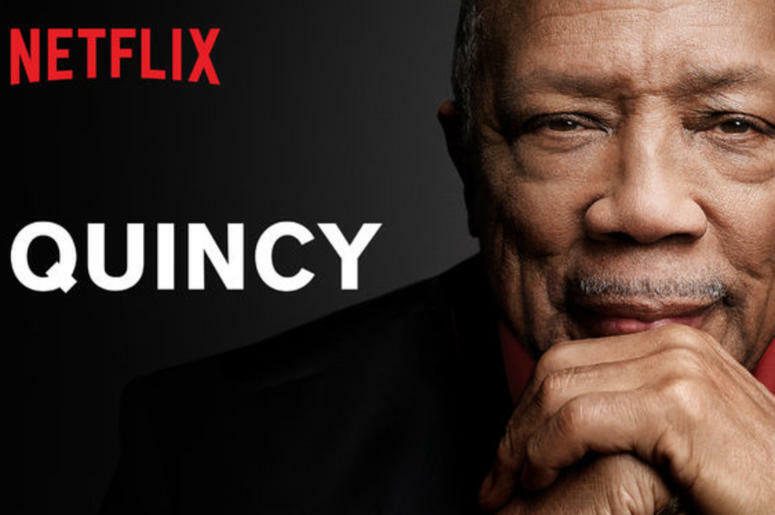 While I’ve always known that writer/musician/composer/arranger Quincy Jones is a big deal, I didn’t know his level of big dealness (yes, I made up that term for emphasis) until I watched Quincy last night on Netflix. To say that he is the most significant contributor to music is not enough. He shaped the music business. In fact, throughout his six decades in the entertainment industry, he has discovered, produced, and nurtured the talent that has made history. He is the reason why Michael Jackson became, and will always be, the King of the Pop. He is the reason Oprah Winfrey is a household name. He is the reason Frank Sinatra cared about desegregating Las Vegas. In addition to those three names, Q (as everyone calls him) has/had long-standing working relationships with Count Basie, Ray Charles, Dinah Washington, Ella Fitzgerald, Will Smith, Stevie Wonder, Dr. Dre, Herbie Hancock, Miles Davis, Paul McCartney, Big Daddy Kane, Ice-T, and the list goes on and on and on. He is a living legend. “You want to be what you see.” (Before discovering music – specifically the trumpet – his childhood experience was consumed with gangsters, violence, and racism). Directed by daughter and actress Rashida Jones (one of his seven kids by three wives), the documentary goes back and forth between the distant past, the present, and the recent past. We learn that Quincy is from the southside of Chicago (born in 1933), was raised around gangsters, had a mentally ill mother (more on that later), and didn’t meet a white person until he was eleven years old. He dealt with racism, violence (he points out scars from an ice pick incident), and thankfully decided that music was going to change his life. To say that every single artist and person involved in the music industry owes Quincy Jones a big thank you is an understatement. At 14 years old he started playing trumpet in nightclubs and shortly after he met and befriended Charles. At 18 he joined Lionel Hampton’s band and then he moved to New York City to follow his dream of composing and arranging music professionally. He says, “I wrote for anyone who would pay.” Quincy credits Dinah Washington for giving him his first break and the next thing he knew he was writing music for Basie and Charles. Always wanting to learn and be the best, in 1957 he traveled to Paris to study music composition and theory with Nadia Boulanger. He completed 200 sessions with Boulanger who was a French composer, conductor, and teacher who taught many of the leading composers and musicians of the 20thcentury. In 1961 Quincy got his first “real job” with Mercury Records and in 1964 he received a call from Sinatra who wanted him to arrange his next album. According to Quincy, that phone call was the turning point in his career. I bet it was. He worked with Sinatra for many years but never had a contract – same with Charles. Clearly it was a different time. Two years later, Quincy moved to Los Angeles and started composing for movies including In The Heat of the Night and The Italian Job which propelled him into stardom. He became the go-to person for albums, movies, and anything else that needed music arranged and/or composed. Throughout the documentary we see the extent of Quincy’s global reach – he’s in Sweden, he’s visiting the Spotify headquarters, he’s being interviewed by various publications, he’s visiting the Smithsonian, he’s presenting awards, etc. In the 1990s he became a humanitarian who traveled all over the world helping to combat poverty. But his busy schedule caught up to him several times throughout his life. In 1974 he had a brain aneurysm and despite the low survival rate he made it through two brain operations. In 2014 he went into a diabetic coma due to excessive drinking and a year later (at age 82) he was hospitalized with a blood clot as a result of too much travel and not enough exercise. Quincy Jones is nothing if not a survivor. One of the aspects that continues to set him apart is his ability to de-categorize music – something Duke Ellington suggested he strive for. By encouraging his artists to mix genres throughout his career, he ensured that his musicians got involved with all facets of music. But making history takes a lot of work and Quincy is definitely depicted as a workaholic who made sacrifices in his personal life to change the face of the music business. Throughout the documentary, the presence (or lack thereof) of his mother looms. As a child he watched her being forced into a straightjacket and taken away to a mental institution. Then he explains that over the years she showed up at inopportune times and sent him notes telling him how he was producing the devil’s music. He still feels that pain. But now he’s a doting father, grandfather, and great grandfather. Clearly his family means everything to him. 27 Grammy wins (including a Grammy Legend Award). One of the few who have achieved EGOT status (Emmy, Grammy, Oscar, Tony). First African American nominated for Best Original Song at the Academy Awards. Produced three Michael Jackson albums: Off The Wall, Thriller, and Bad. Produced the best-selling album of all time (Thriller) and the best-selling song of all time (“We Are the World”). First African American chosen to be the musical director and conductor of the Academy Awards ceremony. Inducted in the Rock & Roll Hall of Fame in 2013. While these numbers are incredibly impressive, they only tell a fraction of the story. Quincy Jones is music. He is responsible for defining so much of music history and creating and cultivating its landscape it’s unreal. All these years later his passion music is palpable and a pleasure to watch. “You only live 26,000 days and I’m going to wear all of them out.” (Now at age 85, he’s already lived over 31,000 days). Thank you Quincy Jones. You saved the music business before anyone knew it needed a savior.